Because the research is clear. Above a basic threshold, more money doesn't make us happier. But we think it will, so we do all sorts of things that make us unhappy in order to get it. A senior leader in an investment bank called to tell me she was leaving her job. She realized she wouldn't make much money in the next few years and didn't want to miss her children growing up. Did you get that? She was willing to miss her children growing up if the money was good enough. People act in ways they'd rather not in order to make money that doesn't make them happy. Maybe, if we do this downturn right, we can get out of that cycle. 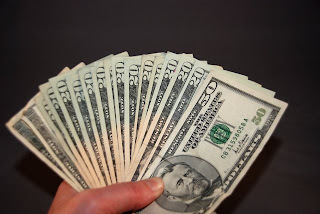 Well, it's true that money does not buy happiness, but I do think that can do a fine job of leasing it, and it's probably a more effective purchasing agent of happiness than poverty. It's possible -- and very commonplace -- to overstate the maxim "money can't buy happiness." I've worked for causes and movements and things larger than myself, and they have only left me impoverished and disillusioned. Now I work for money -- especially since, as a husband and father, I have a moral obligation to provide for my family instead of my ideological predispositions. "Can I take my cat to the emergency vet right now, or must I simply wait and hope that he gets better?" "Can I afford to hire an attorney instead of using this overworked, under qualified public defender?" "If I am quiet enough, will the landlord pounding on the door and demanding rent believe that I'm really not at home?" "Will the car start this morning and get me to work?" To be poor is to live closer to the precipice of losing so much, and to be rich is to have increasing distance from those dangers. Money cannot buy happiness, but it can buy essential components thereof, such as health and security. It is possible to go to far, as in the example that Bregman provided, to seek greater wealth at the expense of one's family. But only the wealthy can afford to muse about downshifting their lifestyles. I am reminded of a line from Man of La Mancha, in which Don Quixote enters the inn, and a woman working there questions that this lunatic in rusty armor can afford to pay. 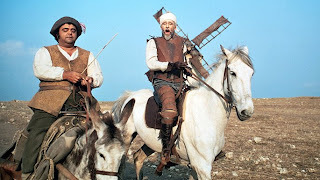 But the innkeeper has already discerned that Quixote is wealthy. "Of course he can pay. Since when did a poor man ever have enough time to go mad?" Bregman was able to afford to reduce his household earnings and establish a lifestyle that was more emotionally fulfilling for his family. Good for him. But he should recognize that few people in this world are in a position to do so, and the poor who think that they will be better off rich are not deficient in wisdom. Wow - a link to a post from 2006. That's an antique! Well, back in my day, we didn't have this Twitter or RSS nonsense. We had to blog 10 miles a day, uphill, in the snow, both ways. And we liked it! "Well, it's true that money does not buy happiness,..."
I like to say that money might not buy happiness, but it certainly helps to banish misery. That's a very good way of expressing it. The opposite of misery is not happiness, but the opposite of misery is better than misery.